September seems so long ago. 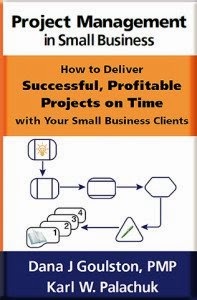 Way back then, I posted a seried called "Managed Services In A Month." It was very popular. It still is. But blogs are difficult to read because they're in reverse chronological order. So I reposted the whole series over at www.greatlittlebook.com. That has also been very popular. In fact, we have the main page, SMB Conference Call page, and then Managed Services In A Month. But I also get emails. You've requested this in book form so you can have it in a nice handy format. You've also reqeusted it on CD so you can listen in your car. And you've requested it in MP3 format so you can listen to it the rest of the time. I've logged about 700 requests for this information. So, as a man of the people (the people with $20 to spend), I'm going to give you what you want. The following are expected to ship May 1, 2008 at $20 each. You may pre-order them beginning today at $15. This is limited to the first 100 purchases for each product. First, I'm not getting rich here. At $15 each, consider it a gift. You could buy me two beers at the next conference, or one of these. A very well respected member of our community thinks this should be priced at $49. But . . .
Second, this material is still available for download (for free) on the internet. That's not going away. But it IS more than 100 pages of material. So it might be inconvenient to read online. Get it for free on the internet. Or buy the book for $15. Or buy the 3 CD set for $15. Or buy the 140 minute MP3 for $15. 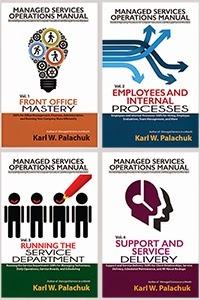 If you've gotten any value from the Managed Services In A Month series, consider buying the book, CD, or MP3. We're in the evaluation phase of Zenith and so far, really like it. We were thinking of Kaseya, too, but the expense is off-putting and it places the burden far more on us and if your labor situation is anything like ours (we're based in SoCal), we face high cost of living so finding affordable, quality techs who can afford to live in our area is always a challenge. Problem solved with Zenith. I've enjoyed reading your posts about Managed Services and I look forward to reading your posts when I have the time. We're in the same business--well at least one of your businesses, that is!